The direct bus is the most convenient and comfortable way to go to Takayama(Kawaguchiko) from Kawaguchiko(Takayama). You can also take a train to go to Takayama(Kawaguchiko) from Kawaguchiko(Takayama). However, with trains, you have to transfer a couple of times and carry all your luggage. On the other hand, highway bus will take you straight to the destination without any hustles. You can travel from Kawaguchiko Station to Takayama Nohi Bus Center directly without a transfer. You can reserve seats three-month in advance. You do not need to carry your luggage when traveling from one place to another. Bus stops for a break a couple of times on the way to the final destination. You can enjoy viewing the scenery from the window while traveling on the bus. What is Service Area(parking area) ? You might have heard of service are or parking area when you travel through Japanese highway road. Service area and parking area are simply just a rest area on highway. There are restrooms, smoking area, vending machine for beverages, café, bakery, souvenir stores and more. It is worth it to visit Japanese service area once. 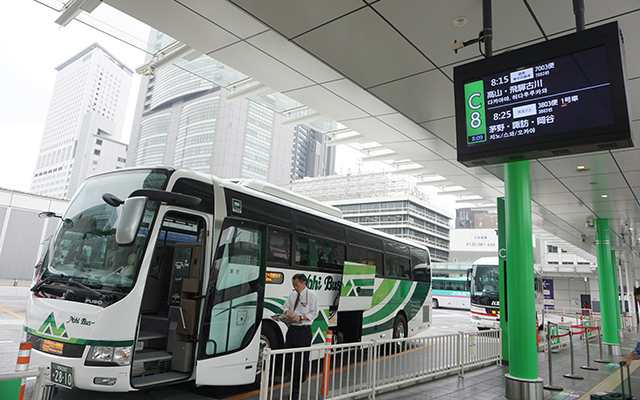 If you are traveling from Shinjuku Expressway Bus Terminal to Takayama and Kawaguchiko and back to Shinjuku Expressway Bus Terminal, the bus stops at the following rest areas. Shinjuku → Shakado PA(Parking Area)　(15 minutes) / Suwako SA(Service Area) (20 minutes) / Alps Kaido Hirayu right next to Hirayu Onsen Bus Terminal(10 minutes) → Takayama → Alps Kaido Hirayu (10 minutes) / Yatsugatake PA (Parking Area) (15 minutes).